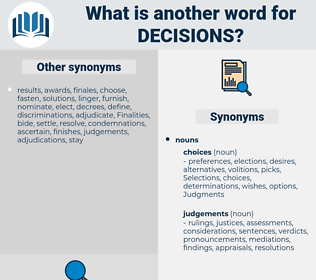 What is another word for decisions? opinions, choices, options, terminations, events, judgment, actions. dispositions, rules, Canadians, Rights, determinations, resolutions, decides, decrees, judgements. discussion, defence, sanctions, convicted, eradication, world, des, johannesburg, reports, agenda, working, code, disarmament, determination, determinations, mandates, noon, OSCE, special, chairman, resolution, summit, x., regional, cop, category, Of, summary, b., U, bank, resolutions, X, iv, WIPO, rulings, 2.5, She, decides, decree, decrees, judgements, order. 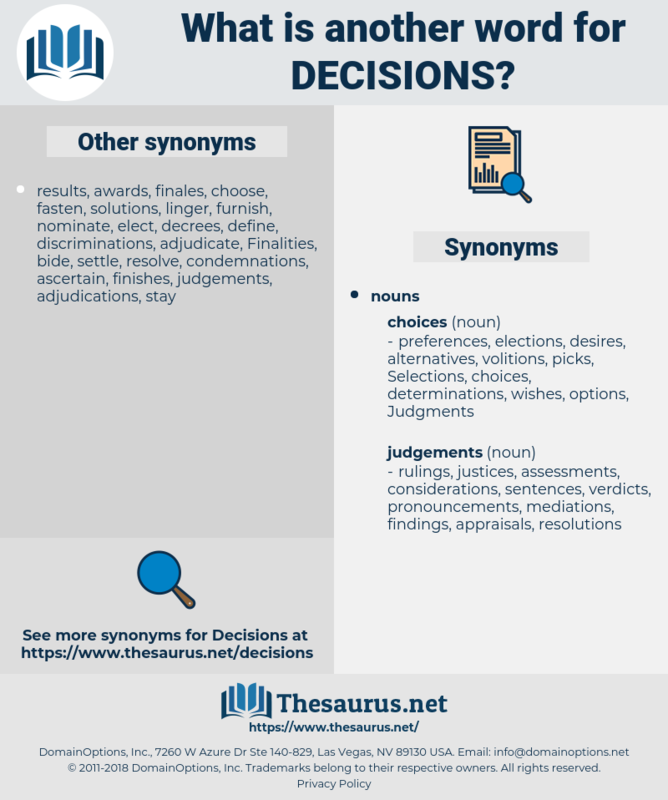 decisiones, Recommendations, decision-makers, considerations, instructions, determines, deliberations, proceedings, dispositions, Selections, decretos, Consultations, investigations, convictions, conclusions, definitions, directions, conditions, proclamations, verdicts, assertions, discussions, Prescriptions, positions, consequences, orders, prosecutions, devices, dealings, situations, elections, ordinances, acquisition, responsibilities, allocations, commissions, purposes, policy-makers, implications, agreements, policymakers, commitments, pronouncements, questions, reactions, matters, directives, Regulations, contents, instances, minds, operations, continues, initiatives, Appointments, principles, judges, citations, precedents, moves, issues, details, times, commander, organization, Organizations, courses, procedures, candidates, authorities, reasons, transactions, malfunction, malfunctions, shortcomings, Deficiencies, development, developments, lessons, deliverables, Guidelines, minutes, settlements, occasions, rules, Motions, applications, comments, functions, responses, divisions, Records, absences, leaders, settings, words, documents, factors, Ideas, steps, establishes, preferences, means, arrangements, processes, things, dismissals, provisions, Policies, alternatives, inadequacies, commissioners, report, demands, resolves, grounds, utterances, jugements, VOTES, closures, shutdowns, 'affaires, tons, Investments, trade-offs, interests, proposals, complaints, committees, projects, assessments, terms, needs, fields, hands, structures, mistakes, Undertakings, Resources, requirements, defects, boards, Measures, instruments, councils, mechanisms, Ones, costs, behaviours, elements, Efforts, components, articles, conflicts, applicants, stopovers, Penalties, TONNES, failed, statutes, secretary, plans, trials, DTCS, powers, ministers, tribunals, Analyses, transparent, failures, masters, magistrates, terrorism, Duties, errors, accords, changes, affairs, skills, charter, values, drafts, referees, managers, Measurements, parliament, approaches, answers, remarks, models, causes, tasks, loopholes, observers, presented, results, checks, taking, substances, Rights, laws, files, shortfalls, banks, delegates, Surveys, Treaties, supplies, shall, launch, methods, governors, crashes, benefits, Stories, Granting, Standards, Lives, requests, heels, stops, items, makers, lapses, weaknesses, fixing, Remedies, chemicals, failings, groups, phrases, rulers, texts, norms, materials, Bodies, parts, seekers, forum, merits, shares, decide, practices, page, head, ..., Shots, Activities, lands, cheques, levels, subjects, reforms, Programs, faults, 2000, Phases, CUBS, members, Areas, cars, controls, experts, flaws, women, _, breaks, markets, table, #, Studies, frameworks, takes, calls, 38, sanctions, accounts, states, meeting, meetings, bugs, claims, gaps, six, 2005, Parties, 39, problems, reports, determinations, mandates, rulings, deciding, decides, decrees, judgements. Chose, dictated, resolved, opted, agreed, made, decided, decides. Adjudicating, exercising, shaping, planning, reviewing, casting, acting, Granting, deciding, decides. documented, taken, retained, made, decided, jurisprudence. chooses, determines, dictates, matters, processes, resolves, plans, makes, takes, determinations, decides. adjudications, solutions, outcomes, stoppages, courts, appeals, jurisprudence. Any person or place where certain decisions are obtained. These decisions were greatly in favour of Austria. dysomia, deaccession, da gamma, dot com, day game, disown, dioecian, daoism, disunion, dodgem, dasheen, dot-com, dutchman, dissuasion, deskman, disney, deacon, deign, Duke Wayne, dadaism, dizen, disjoin, dijon, dicksonia, dodgson, djinny, dozen, dioxin, dusicyon, decennium, dkm, dismay, djinni, digoxin, daisy-chain, doeskin, discina, dagan, diegueno, dysosmia, discussion, dogma, dawson, deism, dexone, diazonium, daikon, design, dagon, dodecagon, diocesan, decuma, dig in, Dutch Guiana, dagame, Day Jessamine, daisy chain, decagon, dacninae, dudgeon, dietician.